Karlsruhe, April 27, 2018 - Cognex, the global leader in vision-based inspection and identification systems, has successfully launched its new MX-1502 mobile data terminals. These modular devices are mainly used in logistics. VTL Vernetzte-Transport-Logistik, a general cargo cooperative based in Fulda, has recently also been using the Cognex MX-1502 readers for mobile logging of logistics data. For future-proofing and flexibility, VTL has focused on Android-based devices. Smartphones mounted in the shockproof housing of the MX-1502 are being used as mobile data terminals together with a powerful image-based Cognex scanning unit. VTL is now using the Samsung Galaxy J3 smartphones in the MX-1502. Due to the modular design of the MX-1502, with its special rubber inserts and a screen protector, nearly any Android- or iOS-based smartphone can be used, and easily replaced with a new model in the event of damage or a generational change. The smartphones are housed in a shockproof, splash-proof polycarbonate housing. The mobile terminal is suitable for harsh industrial environments, and even withstands 50 drops from a height of 2 meters onto concrete. Thus, both the Cognex scanning unit and the smartphone will remain intact. Repairs are now much simpler than before, since with MX-1502 customers only need to replace individual components, such as the mobile device or optics, and no longer has to replace the entire terminal. In addition to low operating costs, this provides high investment protection. At VTL, conversion to the new devices was very rapid - the implementation phase, including complete redevelopment of the terminal software and conversion from Windows CE to Android, lasted only six months. Daniel Stederoth, IT system administrator at VTL, is convinced that the entire MX-1502 integration project has been quite successful: "With the modular design of the mobile terminals and the use of commercially available smartphones, we have found an optimal solution in terms of investment protection and operating costs. The inductive charging and battery performance bring considerable practical advantages." MX-1502 devices are charged inductively, i.e. wirelessly. Thus, no electrical contacts can wear out or fail. 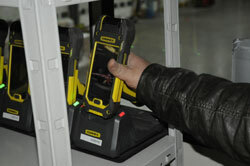 The mobile terminal has a lithium-polymer battery that powers the scanning unit and the smartphone. Daniel Stederoth emphasized the importance of battery performance: "With the inductive charging stations, charging is quite simple and there are no signs of wear on electrical contacts. Here, competitors have clear weaknesses." With the two Li-ion batteries in the pistol grip, which is available as an optional accessory and used at VTL, battery capacity greatly multiplied. Cognex Corporation designs, develops, manufactures, and markets a range of products that incorporate sophisticated machine vision technology that gives them the ability to “see.” Cognex products include barcode readers, machine vision sensors, and machine vision systems that are used in factories, warehouses, and distribution centers around the world to guide, gauge, inspect, identify, and assure the quality of items during the manufacturing and distribution process. Cognex is the world's leader in the machine vision industry, having shipped more than 1 million vision-based products, representing over $4 billion in cumulative revenue, since the company's founding in 1981. Headquartered in Natick, Massachusetts, USA, Cognex has regional offices and distributors located throughout the Americas, Europe, and Asia. For details visit Cognex online at www.cognex.com.